Guinea's military government has announced it is setting up a commission to investigate the shooting of protesters in the capital last week. Its members are to be drawn from political parties, unions and civic organisations as well as the military. Human rights groups say 157 people were killed in the incident, while the government puts the figure at only 57. Opposition parties have rejected meditation talks until those behind the stadium killings face justice. National Public Radio's West Africa correspondent Ofeibea Quist-Arcton, who is in Guinea, told the BBC the military government is coming under pressure from home and abroad to address the outrage over the deaths. She says while businesses have reopened, there is still a sense of shock in the capital, Conakry. 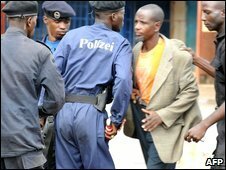 Witnesses say Guinean soldiers fired on an unarmed crowd that gathered inside a stadium in Conakry to protest against the government. They also say many women demonstrators were raped. The military government urged all parties to nominate their representatives to the commission as soon as possible, but no time-frame for the investigation was given. On Wednesday French Foreign Minister Bernard Kouchner said he suspected Guinea's military leader Capt Moussa Dadis Camara had participated in the decision to launch the bloody crackdown. Guinea's strongman has blamed "uncontrollable soldiers" for the violence, as well as the opposition for calling the rally in the first place. Last week's protest was called after rumours that Capt Camara , who took over in a coup last December after the death of long-time ruler Lansana Conte, indicated he may run in January's elections, having initially ruled himself out. Earlier US Secretary of State Hillary Clinton said Washington was appalled and outraged by the "vile violation" of people's rights and intended "to pursue appropriate actions" against Guinea's military rulers. 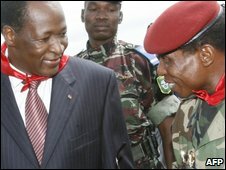 Burkinabe President Blaise Compaore is mediating in the dispute on behalf of the regional body Ecowas and has proposed that the military leadership and opposition meet in Ouagadougou for talks.